Getting utmost visibility while driving is essential not only for convenience and prevention of eye strain, but for your protection too. Without using the right lighting, you will find it more difficult to drive during night time. If you are worried about your existing budget, be reminded that the best LED light bar can be obtained even at a lower price than you thought of. Reviews of the top light bars are not enough in selecting a product to buy. You should have guidelines that will assist you in selecting one. Furthermore, you should also learn the proper utilization of the item once you have purchased one. To begin your decision-making, read through the excerpt given below. 2.2 What to Look for When Buying the Best LED Light Bar? This LED light bar is a kit of Deutsch switch, connector of the same origin and two mounting brackets. It is a 10-inch light combination of floodlight beam pattern and spotlight. It is also made of patented hybrid optics. If you are looking for a LED light bar that is sufficient for an all-around distance illumination, Rigid Industries 110312 E-Series LED Light Bar is a good choice. It is constructed with dual housing with different mounting options, which means you can set it up in different areas of your vehicle. The product also has the new 304 stainless brackets from the brand with three placements. Rigid Industries 110312 E-Series LED Light Bar is one of the many LED light bars available under Rigid Industries E-Series. This product is guaranteed to be made out of top-of-the-line engineering and advanced technology. Aside fromthis product, there are also LED light bars in varying configurations and lengths. You may use this LED light bar in cars, racing vehicles, and light trucks. It could also serve as emergency or industrial LED light bar. It is designed to protect illumination at farther distances while accumulating mere amount of power. The hybrid optics system of the LED light bar captures the highest amount of light emission from the bulbs. Projection will then be done to where you have targeted it. This is a combination of a spotlight and a floodlight beam pattern. It produces light brightness of up to 24,800 lumens. According to its manufacturer, it is a combination of Cree LEDs and Advanced Bright Technology under the brand. Consequently, OPT7 C2 Series Off-Road Cree LED Light Bar resulted as a durable light bar generating clean and superior beam pattern. Maximum illumination while onthe road will not be an issue even if you are driving at pitch black environments. The construction of the light bar is also sturdy enough to resist damaging elements in the environment. Its casing is manufactured out of heavy duty aluminum material. The lens making up the light bar are made from polycarbonate material. Overall, OPT7 C2 Series Off-Road Cree LED Light Bar is designed to create an IP67 rating and protect against harshest substances. Heat is also dispersed effectively from the device given its expanded thermal management heat sink. The light bar’s LED bulbs will not only shine brighter, but cooler as well. This explains why the light bar is anticipated to last more than 50,000 hours. The LED light bar is very easy to mount on your vehicle given its adjustable components. Even its lights can movedfrom side to side. Keeping the light bar is also easier since it features Moisture Evaporator Valve (MEV). This is an off-road and work LED light bar with a measurement of 7 inches. It requires 12 volts to power up, and is compatible with ATVs, cars, SUVs, and even trucks. The light bar makes use of a 36-watt spotlight beam pattern. It assures superior brightness given its illumination pattern. The Nilight Spot LED Light Bar is designed with high quality LED chips that are concentrated and bright. Lighting up the road ahead of you will be done effectively especially during night time. To ensure that your light bar will not heat up extensively, the Nilight Spot LED Light Bar is constructed with silicone gel with high conductivity level. The light bar is also designed with casing out of aluminum material. Superior reduction of temperature will be enforced to the LED bulbs even when the light bar is constantly used. The LED light bar is also sealed fromwater as guaranteed by its IP67 rating. Even if you immerse it into up to 1 meter of water for half an hour, it will stay completely dry. Furthermore, this product is dustproof. Apart from the aluminum housing, it is also designed with stainless steel mounting brackets and robust glass. This ensures that the LED light bar will be able to withstand even the harshest of weather conditions.You can securely install the light bar on your vehicle using its side mounting bracket. Even if you encounter an earthquake while driving, it will stay intact on a rugged terrain. This is a 288-watt LED light bar that measures 50 inches and is applicable for UTV, ATV, pickup truck, and light duty cars. It is claimed to have a perfect construction made up of OSRAM Led ships. This guarantees an extremely broad viewing area. The combination of its illumination pattern is made up of 40 degrees flood and 10 degrees hyper spot lighting. 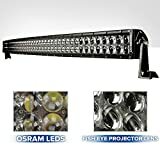 For its specialized design, it consists of fish eye projector lens that could produce light at farther distances compared to other LED light bars. Even if its generation of light is extended, it ensures little consumption of power. Although the Auxbeam Curved LED Light Bar is introduced as an extremely powerful product, it is protected by its construction. It has IP67 waterproof rating, sealing the bulbs from water and dust despite changes in climates. You may also use it in vehicles traveling in rough terrains for it is shockproof. The great performance of the Auxbeam Curved LED Light Bar also extends to the fact it has a large heat sink, allowing the dissipation of warmth effectively. This also promotes longer lifespan at more than 50,000 hours. Additionally, it has an exhaust valve design, which draws out vapour from the light bar and keeps your light bar clear. The LED light bar also comes from one of the trusted names in the industry. Auxbeam is a reputable provider of vehicle accessories and LED lights. Superb Effect: Up to 28800lm Luminous Flux and 96 High Power LED will light up everything you need to see. 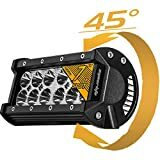 This is a 36-watt LED light bar that measures 7 inches. It is a LED work light that produces illumination with the aid of its spotlight beam pattern. This product is also useful for off-road application. This heavy duty LED light bar is composed of 12 pieces of 3-watt high-intensity Cree LEDs. Since it is constructed with easy to use brackets, the installation will be fairly easy. The quality assurance provided by the product is also high since it made up of durable materials. You can begin with the high-quality aluminum casing, ensuring a cooler LED operation. The container is also designed with robust glass material. The brackets are made of stainless steel for secure fitment. Eyourlife LED Light Bar also used silicone gel in order to enforce waterproofing in the product. This LED light bar obtained IP67 rated seal, which also implies it is highly protected against corrosion and rust. The LED light bar is designed with slide brackets. This means that you can choose where you want to install this product without worrying about the brackets. Eyourlife LED Light Bar allows users adjust the direction of light up to 45 degrees. Similar to its counterparts, you may use it in a variety of vehicles. Included in its list are ATVs, light trucks, jeeps, mining vehicles, off-road cars, and project vehicles among others. LED light bar reviews are not sufficient if you are not aware of the basic facts about the product. Be reminded that you will still select from a pool of options if you cannot sort out the items according to their types. Particularly, LED light has become the greatest option for drivers for it outperforms other types of light bars extensively. You could begin with its extended lifespan of more than 20,000 hours. In addition, it has a longer range of color temperature options, particularly 1,100 to 9,000K. Truck LED Light Bar – If you are using your truck for either personal or professional application, LED light bar intended for it is highly advised. Normally, this type of light bar is installed across the vehicle to ideally illuminate any highly, particularly during night time. Note: Most people use truck LED light bar on the tailgate while some also adds a red LED brake light for better visibility. ATV LED Light Bar – Aside from improving your visibility during night time, it provides great features in terms of light duty intensity and brightness. While trailering, you may use this continuously since it collects small amount of current compared to other types of LED light bar. Off-Road LED Light Bar – The objective of alight bar is to brighten the road ahead. It is designed to withstand harshest of climates. Shocks and bumps are also easily resisted by the sturdy build of the light bar. Emergency LED Light Bar – This is the kind of lighting required by public service vehicles, trucks, police cars, and ambulances. You could find this light bar installed on the roof, grills, mirrors, and sun visors. For maximized visibility, you should select blue, white, red, or yellow color. Marine LED Light Bar – From the name itself, this is used for navigation vehicles and comes with waterproof construction. These light bars are also used to illuminate compartment of engines. Strobe LED Light Bar – This type of light bar is often in green, white, blue, amber, or red color. The objective of this light is to alert your peers of probable danger. What to Look for When Buying the Best LED Light Bar? There are aspects that you need to consider when finding the best LED light bar for the money. It is not enough to focus on the brand, model, or price. It is more imperative to consider the features, which will entail the advantages you will reap from the item. 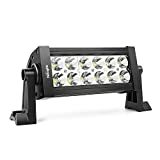 1) Flood or Combination – If you are looking for the top quality Cree LED light bar, you have to find floodlight beam pattern or a combination of floodlight and spotlight bulbs. By doing so, you will be able to illuminate the road sides while driving instead of lighting up just the terrain in front of you. You will never know if there are objects that can cause accidents when not avoided. 2) Amp Draw – You need to ensure that the LED light bar you will buy is not going to die easily. You need a product that can last long even if you are traveling miles away from your home. Amp draw is a major concern if you are using a large-sized light bar. As a rule of thumb, look for LED light bars that have lower amp draw. Cree LEDs are good example of this, which can also guarantee high energy effectiveness. 3) Lumens – Understanding lumen, which is the unit utilized to measure the brightness of a light, is important. This will help you compare the available LED light bars cleverly. However, take note that lights appear brighter when they are directed to the right direction. 4) Durability – Find a LED light bar meant to resist all the possible elements that could cause damage. Aside fromwater resistance, it is best to find a light bar that can get through trails filled shocks and bumps. 5) Dual Setup – You may be offered with a large LED light bar by a store but if you can find a set of two LED bulbs, the better it is for you. This will provide you freedom of maximum illumination since you can target different directions at a time. Even if you claim that you are holding the brightest LED light bar, it will still not be effective or useful without setting it up properly. There are professional recommendations that you still have to consider in order to reap the most out of the light bar. Instead of focusing on the question “What is the best LED light bar?” you should also ask how to make it work for road support effectively. 1) Check the Legality – Before you even jump into installing LED light bar, check if the product you have used can be utilized legally under state or local regulations. There are cases auxiliary lights on your vehicle may be asked for removal, particularly when too large. Alternatively, there are states where you have to cover the LED light bars when not using your car off-road. 2) Get the Necessary Tools – To complete the installation of your LED light bar, you need tools which are not often obtainable along with the package. Most likely, you will need pliers, screwdrivers, measuring tape, and wrenches. Cabling may require strippers, crimpers, and cutters. 3) Use the Right Crimpers – When wiring connectors of LED light bar, you need to use the right type of crimpers. To ensure that these connectors will not leak, use electrical tape or silicone coating. 4) Take Caution Before Wiring – Prior to wiring the LED light bar, you should always detach your battery’s negative terminal. 5) Practice Safety While Fusing Wires – Primarily, you should fuse the cables to the expected current draw. If the LED light bar generates 10 amperes or higher, you should utilize an automotive switching relay. You must also utilize a cab switch with rating of at least 10 amperes with or without a relay. 6) Neutralize the Booster Battery – Your power source should be neutralized before being used. It is a potential hazardous storehouse and this is why you need to disconnect the battery beforehand. Relatively, you need to detach the ground terminal clamp, which will be followed by disconnection of the side clamp with positive charge. For easy removal, you should prevent unnecessary spices. Connectors of wires should also be waterproof. Safety while driving should not be compromised by slacking in finding the best-LED light bar to use. Remember, you have tons of options. It is also plain to see that the aforementioned list has a winner – Rigid Industries 110312 E-Series LED Light Bar. The immensely powerful LED light bar is not only among the superior products under Rigid Industries, but an outperforming option than its counterparts. This can be proven by its unequaled night time visibility. Its powerful light generation is even perfected by its combination of floodlight and spotlight beam patterns. Every package of the product comes with everything you need. The installation process is hassle-free, which is another reason for you not to delay the setup.